Melodic Death Metal is one of the genres I used to enjoy the most for a very long period. After many of the considered best bands started recording terrible material, I started to lose interest in the genre. When I got to know about Nox Aeterna latest album, “’The Desperation Deal”, I was a bit skeptical not because of the band, but rather due to the latest experiences I had with the genre, but I decided to give it a try. And I don’t regret it at all! Before I share some words about the album, allow me to quote some information about this band for those that aren’t familiar with Nox Aeterna yet. Nox Aeterna is a five-headed melodic death metal band from The Netherlands. Formed originally in April 2002, starting out as a symphonic rockband, Nox Aeterna has matured into an experienced band with an extensive own repertoire and a solid sound. Inspired especially by Scandinavian metal, the band brings their own heavy and melodic sound for over a decade now. Concerning “The Desperation Deal”, in 15 songs, divided in 4 chapters, this conceptalbum tells the tale of Einarr, his brother Jorund and the demonical Raanah. Obviously you are already aware that I did enjoy this release very much; it’s indeed a work that made me want to look for more material in the genre. Nox Aeterna, even though plays a sound of its own, creates their own brand, plays the kind of Melodic Death Metal that reminds me of the great days of the style, when we had many bands releasing qualitative material. And so is “The Desperation Deal”, with catchy music, keyboards used with taste, not overusing it at any time, interesting, exciting riffs, acoustic bits, imposing atmosphere and vocals that are harsh, but never exaggerated, just right. This entire package can be summarized as a very solid, impressive and stimulating album. The music is, as the genre self-explains, melodic and extreme, heavy and crunchy while there are some more soothing elements with the use of synths, resulting in diversity within the songs. I believe that this is the kind of album that the music grows/ feels better with more listens. I highly enjoyed it the first time I heard it, find it even better on the second and third times. The production is also another positive aspect of “The Desperation Deal”, well-recorded, well-balanced, making the whole experience even more pleasant. And remember, my friends, an independent release recorded at their own studio. Kudos to that. 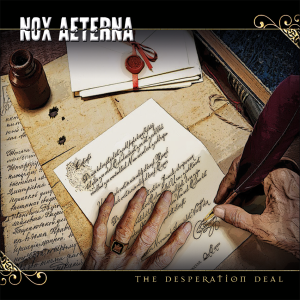 So, my cherished readers, I urge you all to give Nox Aeterna a try and if you like their music, please, please, find a way to support and/or support this band.